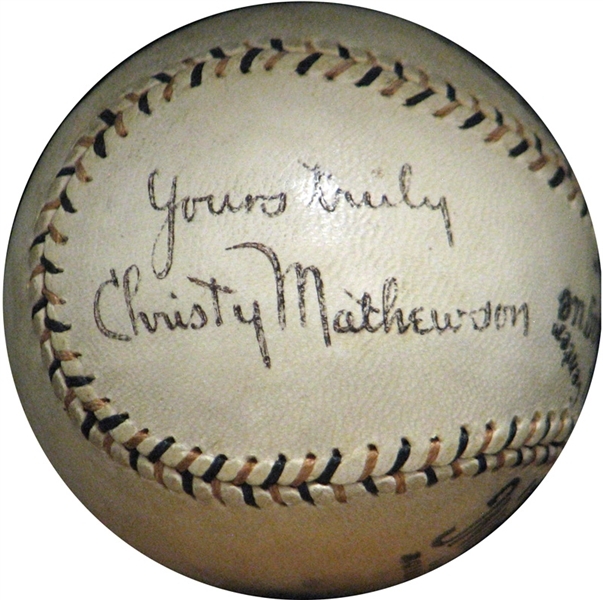 Castle Rock, CO –If you thought “The Beer Box Find” and the Brian Goldner Collection were big events, Mile High Card Company is about to shake up the sports collectibles market with the finest selection of rare autographed baseballs and game-used items in the company’s history. 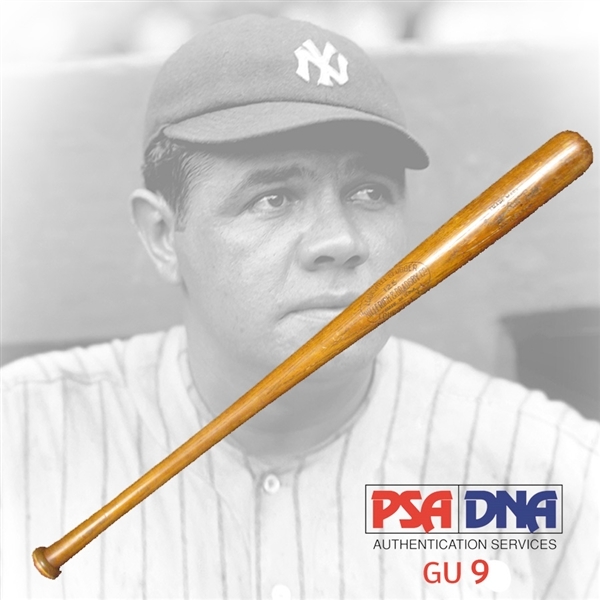 “The 1933 Goudey #49 Babe Ruth PSA 8 is a great headliner for the sports card section and the memorabilia in this auction will be talked about for a long time. This is our best and most comprehensive auction to date” said MHCC President and CEO Brian Drent. 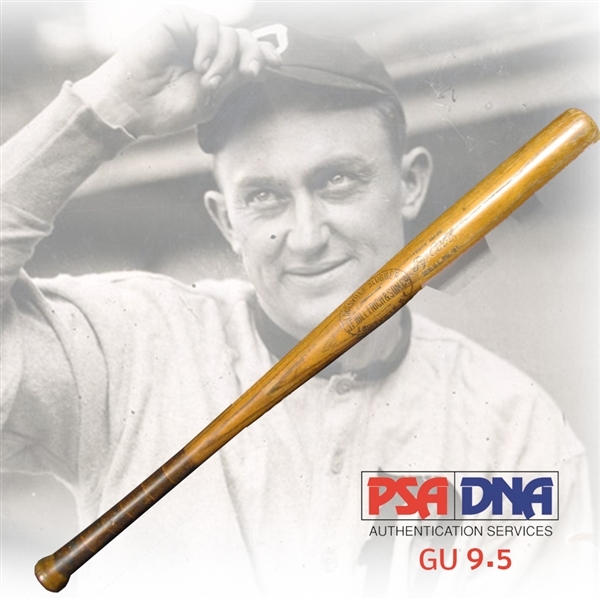 World-class items include a 1929-30 George "Babe" Ruth Professional Model H&B Louisville Slugger PSA/DNA GU 9, 1910-1915 Ty Cobb Professional Model Hillerich & Son Louisville Slugger Bat PSA/DNA GU 9.5, the finest single-signed Christy Mathewson baseball known to exist with JSA, Rogers Hornsby Game-Used Bat PSA/DNA GU 8, spectacular Ty Cobb Single-Signed OAL (Johnson) Ball Dated In His Hand PSA/DNA, Walter Johnson Single-Signed OAL Ball PSA/DNA and JSA, Connie Mack Single-Signed OAL (Johnson) Ball PSA/DNA and JSA, Tris Speaker Single-Signed OAL (Barnard) Ball PSA/DNA and JSA, 1939 Inaugural Hall of Fame Induction Ceremony Signed OAL (Harridge) Ball Featuring (15) HOFers Including Ruth, Alexander, Wagner, Young, Johnson, Etc., and a 1939 Inaugural Hall of Fame Induction Class Cooperstown Signed First Day Cover Featuring Wagner, Ruth, Cobb, Young, Speaker, Johnson Etc. PSA/DNA 9 MINT - The Finest Example Known to Exist. Also featured is one of the finest advertising pieces known, a circa 1910 Spectacular Peach (J.A. Peach Company) Baseball Gloves Advertising Display. 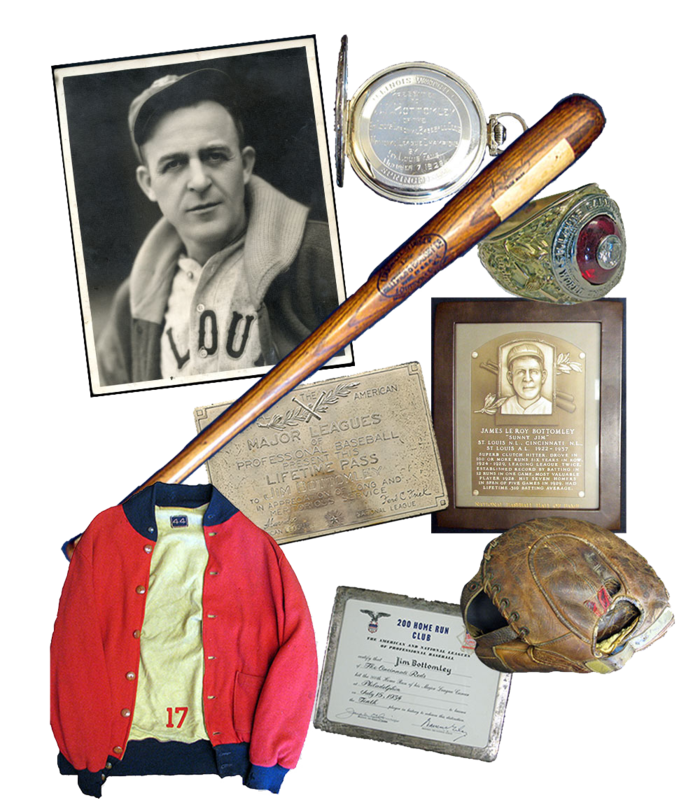 Another featured section of the auction is Jim Bottomley Collection, 85 lots from the personal estate of Hall of Famer “Sunny Jim” that includes his Professional Model H&B Bat Game-Used 1926 World Series Bat PSA/DNA GU 10, 1931 St. Louis Cardinals World Series Championship Ring, Professional Model Game-Used Glove PSA/DNA, Major League Lifetime Silver Pass, 1920s-30s Game-Used Cleats, Signed and Cancelled Bank Check, and a 1932 Dizzy Dean Rookie Year St. Louis Cardinals Game-Used Warm Up Jacket Gifted to Jim Bottomley. 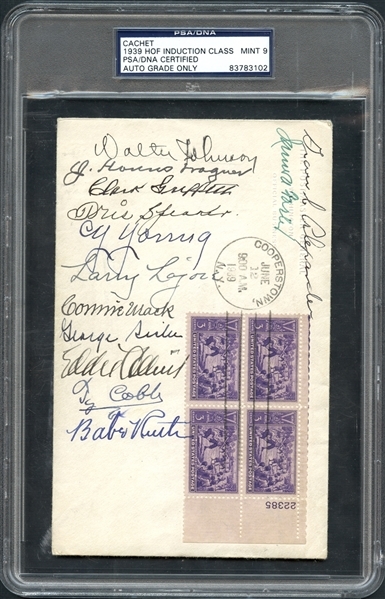 Key cards include 1888-89 Old Judge N173 Cap Anson Cabinet SGC 60 EX 5, 1911 Sporting Life Cabinets M110 Christy Mathewson SGC 60 EX 5, 1948 Bowman #36 Stan Musial PSA 8 NM/MT, 1948 Leaf #4 Stan Musial PSA 8 NM/MT, 1952 Bowman #101 Mickey Mantle PSA 8 NM/MT, 1955 Topps #123 Sandy Koufax SGC 88 NM/MT 8, 1955 Topps #164 Roberto Clemente PSA 7 NM, 1957 Topps #400 Dodgers Sluggers PSA 9 MINT, 1969 Topps #500 Mickey Mantle Last Name in White PSA 8 NM/MT, 1965 Topps #122 Joe Namath SGC 86 NM+ 7.5, 1981 Topps #216 Joe Montana PSA 10 GEM MINT, 1986 Topps #161 Jerry Rice PSA 10 GEM MINT and 1951 Topps Ringside #1 Gus Lesnevitch PSA 9 MINT. 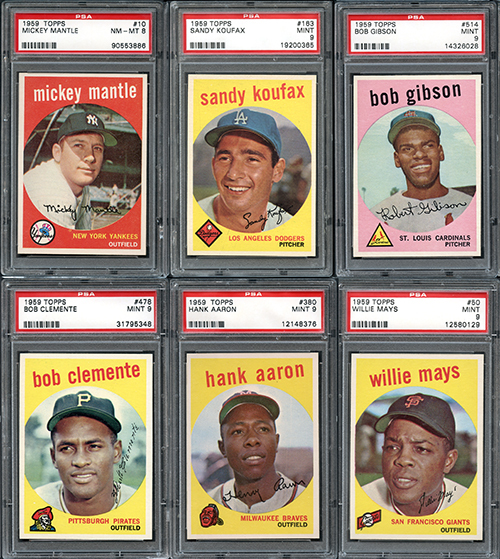 A 1959 Topps Baseball Complete Set #3 on PSA Set Registry with Set Rating 9.48 (with four PSA 10 cards and #515 Bob Gibson RC PSA 9) and a 1951 Topps Ringside Complete Set #3 Current Finest on PSA Set Registry with 8.21 Set Rating will be offered as complete sets as well as in individual lots, with other top-ranked collections that include 1952 Topps Near Complete Set (406/407) with Many PSA Graded, 1952 Num Num Potato Chips Cleveland Indians Set All PSA Graded with PSA 8 Kennedy SP, 1963 Fleer Football Complete Set #13 on PSA Set Registry with 8.04 GPA and 1966 Topps Football High Grade Complete Set #2 on PSA Set Registry with 8.898 Set Rating. Other high-profile lots include a 1960 Topps Baseball Unopened Cello Pack with Mantle on Front GAI 5 EX, 1969-70 Topps Basketball Uncut Proof (Blank Back) Sheet with (44) Cards Featuring Rookie Cards of Lew Alcindor and Havlicek, Bradley, Bing, Hawkins and Lucas, and a 2000 Upper Deck SP Football Unopened Case. Mile High Card Company is accepting consignments for upcoming auctions and there’s still time to get your consignments in. If you desire the maximum possible return for your prized sports cards and/or memorabilia, please call our office at (303) 840-2784 to speak with one of our team of experts, contact us at www.milehighcardco.com.